A project by HopeGiver C.I.C. We do realise that there is a lot of help for those with young children or babies, but sometimes they need a bit of extra support. That's where we fit in. We work alongside food banks, and other agencies, and for those families who are referred we will provide what is needed - formula milk, nappies and wipes.We will get in touch to find out what formula is needed, and what size nappies, and then we will purchase it and arrange delivery to the family - either directly, or via the food bank. When poverty strikes, and you need to resort to the local food bank to feed yourself, where do you go for formula milk? And what do you do for nappies and wipes? Most food banks do their best to help, but often don't have the capacity to store, let alone supply, the wide variety of formula milk available and the different sizes of nappies. So you are often left short of something that is essential to your child's well-being, but expensive to provide. Let's be honest, numbers are small, but they are there. Throughout the current year, we have only had a small number of referrals - it will probably work out at 12 this year, but each request costs between £5 - £15. 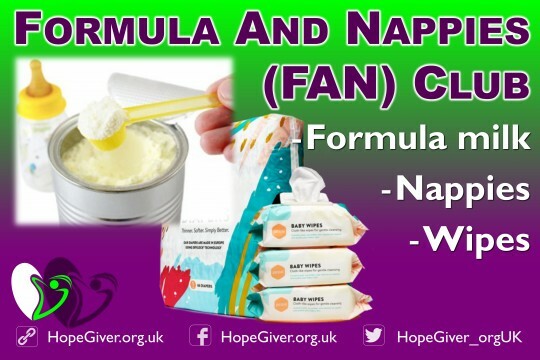 Around £5 will provide a pack of nappies and wipes, and a tub of formula milk around £10 - £12 usually. Every mother wants to do the best for their children, and it's stressful enough without having to worry about buying milk and nappies. Help us make thing easier for those in need. provides a pack of nappies and wipes for our "Formula And Nappies Club"